If you are looking for a workshop, then look no further! 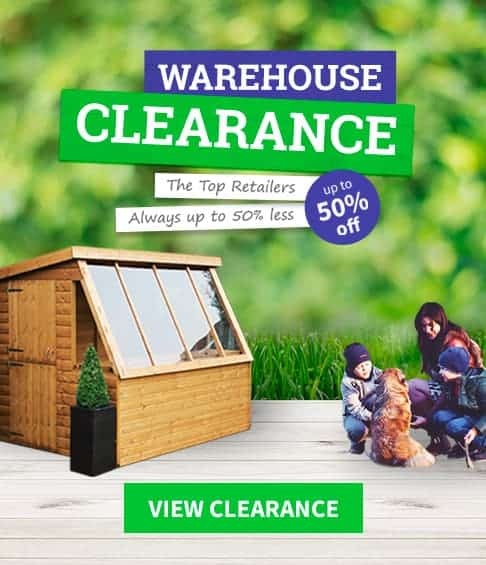 WhatShed have spend hundreds of hours researching all the workshops that are currently for sale in the UK. The following workshop reviews should make your new purchase a little easier. If you feel we have missed anything off the list, please feel free to email us and we will do our best to add more. 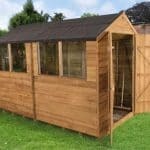 The Forest 8×10 Shed Shiplap Workshop certainly does have that classic shed look, but its large spacious design is what gives it its workshop name. While this is.. 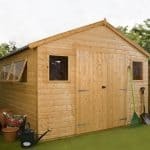 The BillyOh Expert Tongue and Groove Apex Workshop is a very smart looking workshop. 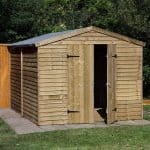 As part of the BillyOh line, it has a classic shed kind of style.. The BillyOh Expert Tongue and Groove Reverse Apex Workshop is one of the more interesting products in the BillyOh line. Clearly this is aimed at those of you.. 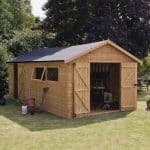 The Shed Republic 8×10 Shed Ultimate Heavy Duty Workshop is one of the most high end 8 x 10 sheds on the market right now. 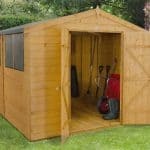 It is also..
At 6 X 10 the Hartwood 6′ x 10′ Double Door Overlap Apex Workshop is one of the largest products in our discount sheds section. This really is.. 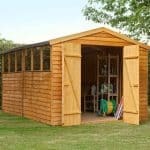 The Hartwood 10′ x 8′ FSC Overlap Apex Workshop is a good sized workshop that has just a ton of personality and will certainly be a stand out..
With a classic kind of look, the Hartwood 10′ x 8′ FSC Pressure Treated Overlap Apex Security Workshop will make a fantastic addition to your garden. 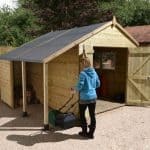 This mid..
Offering you a large amount of space to tackle some DIY jobs or even some artistic projects, The Hartwood 10′ x 8′ FSC Pressure Treated Overlap Apex Workshop.. 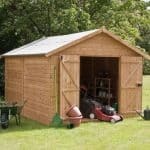 The 10′ x 10′ Windsor Groundsman Workshop Shed is one of the most impressive looking workshops available right now. Its 10 x 10 size means that you have.. 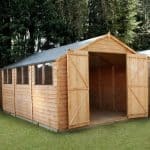 The Hartwood 12′ x 8′ FSC Overlap Apex Workshop is one very large and impressive workshop that is offering you just an immense amount of space to make..
Wow and amazing are the words that first come to mind when you look at the incredible, 8’x6′ Shed-Plus Champion Heavy Duty Workshop with Logstore. This is one.. 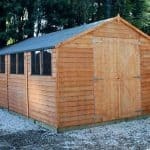 This very accommodating timber workshop offers a lot of storage space for a relatively low cost, so we were very impressed by the value offered. There are some.. 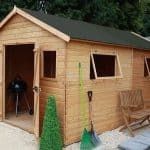 This is an ideal timber building for people who want a durable, yet attractive, and spacious place to carry out their leisure activities or even to act as.. 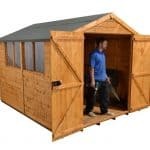 This large timber shed makes an ideal workshop for a very affordable price. 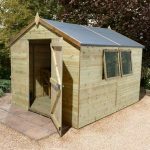 It’s not only the width and depth that are generous, as the roof and eaves..
‘Waltons’ has yet again come up with a superior quality structure- this 20 x 10 tongue and groove modular workshop has large double doors and an incredibly spacious.. 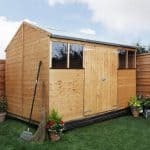 This is a 12 x 10 modular tongue and groove workshop created by industry leaders ‘Waltons’. 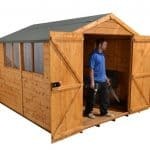 The workshop has large double doors that open up to give you.. 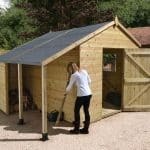 This is a great workshop that provides that perfect option between a standard shed and a full blown brick building. It is strong and very solid, and benefits.. 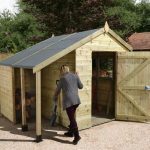 Whether you use it as a base for a hobby, or you’re self employed and use it as a place to carry out work, this workshop shed can.. 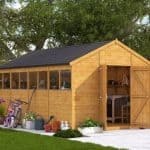 When you have a large workshop in your garden, you’re adding versatility to your home, and this workshop in particular offers great value for money as well. It.. 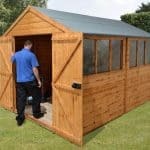 If you need a large workshop for your home or business, but are operating to a tight budget, then this workshop could be an ideal choice. It’s lightweight.. 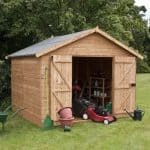 This beautiful looking traditional shed with two tough windows not only has a generous amount of storage space in its own right, it also incorporates a log store.. 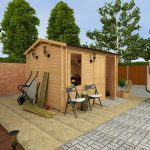 This 10 x 10 Waltons workshop is a great addition to your garden. It has tongue and groove work throughout so you know you have real stability in.. 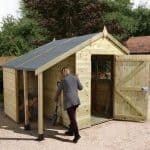 The 10′ x 10′ Windsor Overlap Modular Shed Workshop provides you with a very low cost way to add all the storage space you could ever want to.. 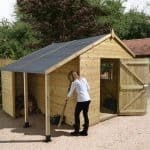 Combining a very attractive design, a strong set of materials and also a whole lot of storage space, the 10’1 x 8’1 Shed-Plus Shiplap Workshop Shed is one.. 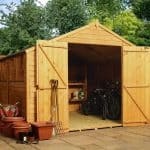 The 8’x6′ Shed-Plus Champion Heavy Duty Workshop with Logstore is one of the most impressive looking sheds out there. It has just such an amazing look and design.. 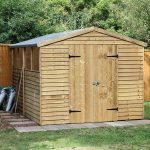 There are sheds that are big and then there are sheds that are huge and huge is certainly the best word to describe the amazing, 15′ x 10′.. 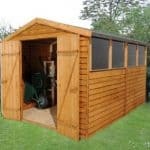 The 10′ x 6′ Shed-Plus Champion Heavy Duty Workshop with Logstore – Single Door is a truly amazing looking shed that has style, strength and an awesome log..
With its large and impressive design the 12′ x 8′ Shed-Plus Heavy Duty Shed Workshop is a structure that is going to make sure you have all the..